The latest grouping of burial skulls have been recovered and documented, this time from an unmarked tomb located deep inside a series of caves west of the city of Palmiste on the northern island of Ile De La Tortue in Haiti. 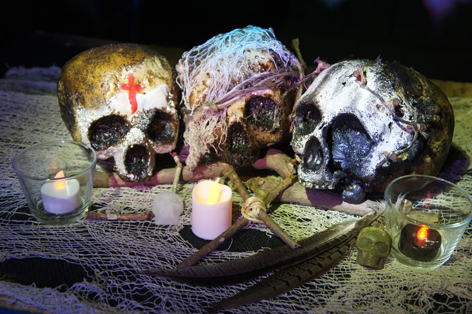 Three skulls, adorned with traditional Haitian Vodou markings were discovered during an expedition into a remote jungle west of the city of Palmiste, Haiti. Upon discovering a series of caves, archaeologists discovered that two of the cave passages had been used for religious ceremony and burial. Along with the recovered skull specimens, various animal bones and religious artifacts were also scattered throughout the cave. 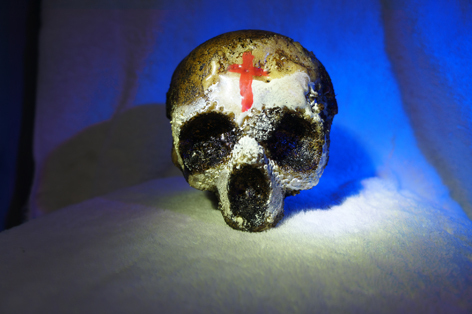 Skull with traditional Haitian Vodou markings. Chalk pigmented white paint embellishment to the face, as well as a cross adorned onto the forehead. Analysis results confirm the cross was NOT a pigmented paint, but was human blood. 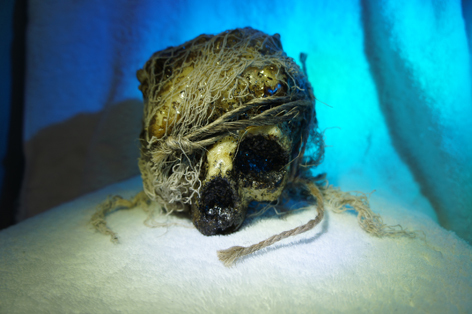 Deformed skull, wrapped in loincloth and bound with jute roping. Right ocular socket appears to be malformed. 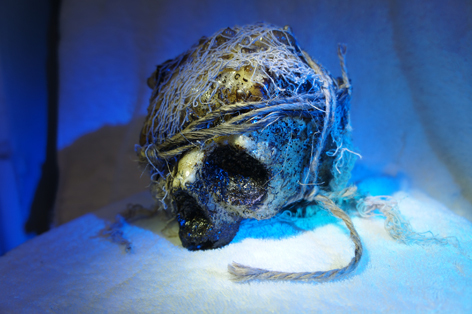 Loincloth and multiple strands of jute roping have been tied around the skull, as if to cover or hide the deformity. This skull specimen is unlike any documented in this region. A separate "skull mask" has been attached to a severely malformed skull in what appears to be a post-mortem edification. This "skull mask" fragment, although decayed in its present state, has been attached, using a series of crude iron nails and jute roping, to a badly deformed and underdeveloped skull. This underdeveloped skull has massive deformity and no recognizable features in its facial region. Upon genetic testing of the separate fragments, test results showed that both shared nearly identical DNA strands, confirming that these fragments had come from siblings. Another set of cast foam skulls are done! 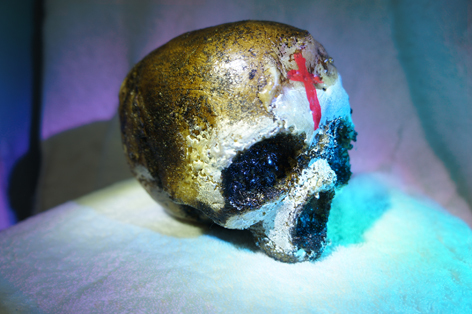 I used the same process as The Peruvian Stigmas and The Six Skulls of Osteopetrosis, in that they were cast using Great Stuff expanding foam and a hollow plastic skull mold. 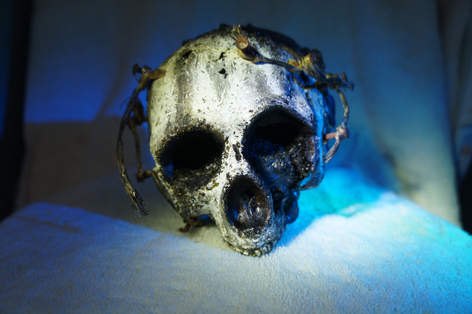 Visit my "Six Skulls" page for a full how-to to see how I cast all of these skulls. On this particular set, I wanted to push it a bit further and created the third skull above. When pulling the foam skulls from the molds, some of the foam is still wet (even after two weeks) and continues to cure and expand as it gets exposed to the air. In this case, the entire face area was still wet, and ended up expanding to a big mess. Along with the wet foam on the skull, I sometimes get some left over liquid foam in the mold itself, and I'll let it set up in the mold, resulting in some cool skull face fragments. 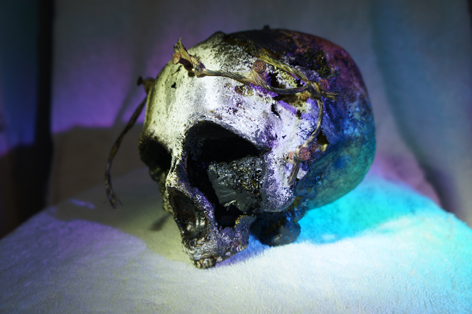 As I looked at the "blobby" skull and the face fragment, an interesting idea came to mind: A Death Skull Mask. I found some old roofing nails and set them into a saltwater bath for a week to get the heavy rusting effect. I then pre-drilled the holes and carefully glued each nail in. I then took some jute rope that I had lying around and decided to connect each nail with the rope, aging and detaching some as I went to create a weathered effect. As always, I started with a base coat of dark wood stain on the skull pieces, quickly wiping away the higher areas for a nice corpsed effect. I then took white ceiling paint and painted the white skull areas, also wiping away some of the higher areas. I then finished with black paint and did a light dry brushing for the dirty areas. After the skulls had dried and I was satisfied with the results, the only thing left to do was to create a fun (and most likely non-factually accurate) backstory! These skulls, along with the previous two sets, will all be displayed on my skull rack in my Halloween yard haunt. Wow, they look really astonishingly gruesome!